Crysis and Crysis Warhead are very well optimized. But both games have 3 times the processibg load of games made on Unreal Engine, due to larger environments, draw distance, AI complexity, and stress on gfx cards for Dynamic Effects. If the effects are preprocessed like HalfLife 2, Crysis can easily run anywhere, but all the cool dynamic lighting and destructible environments have to be sacrificed. And sinc ewe have the gfx cards of today it is logical to use them and stress them for more new features. I agree games need gameplay first, but gameplay is very subjective issue differing among people, whereas graphics is easily decided upon and Crysis simply seems to reign supreme there for 2-3 more years. But it does look best Graphics wise. Also Arma 2 stutters on very high on my machine whice runs Crysis Warhead without lag. Arma 2 has far much bigger levels and rendering load then crysis, but by its very nature of long range tactical gameplay it need such features. Also except operation flashpoint 2 DR, there is not other game comparable to Arma 2 today. 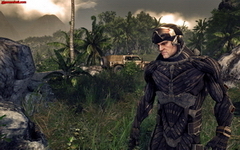 Crysis itself has very good AI, and gameplay even if not unique is different. Being different some people may not like it. Also last 1/4 levels of Crysis are total stupid, but first 3/4 is real good.